Search Results for "totem poles"
Taking in the sights on a cruise to Alaska including some cool totem poles, harbors, glaciers, icebergs and mountains in 1940. Native totem poles inside downtown Stanley Park with 4k resolution. 1930s: Man climbs totem pole, sits on top of pole. Man stands under pole, watches. Totem poles. 1930s: Men stand in front of building in the woods, point at building. Carved animal totem poles. 1930s: Men explore totem poles in forest. Totem poles of the Gitksan Nation in Kispiox Valley, Northern British Columbia. 1933 - Native American men carve peace pipes, small sculptures, and totem poles. 1952 - People enjoy playing cricket, enlarged outdoor checkers, and bowling on the green in Vancouver. Totem poles are also seen. 1952� Shots totem poles in Vancouver, British Columbia, a ship travels under Lionsgate Bridge, a shot of the Peace Arch, shots of the Bellingham cityscape, and visitors looks at the view from Chuckanut Drive. 1952? 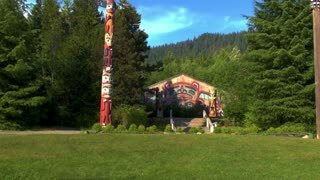 Shots of a large hotel in Vancouver, men play various games at Stanley Parks, and totem poles in Vancouver, British Columbia. The Chilean people hold strongly to their religious practices in the 1940s, which include activities and ceremonies to tribal gods such as dances, music and the use of totem poles. The totem poles of some indigenous locals and a typical native family in their home in Alaska in 1951.